processes and speeding up our reality and the normal rate of evolution. A warp drive to achieve faster-than-light travel might not actually be unrealistic, according to latest research. Scientists have even started to experiment (albeit on a small scale) creating a warp bubble. A warp drive would manipulate space-time to move a starship, using a loophole in the laws of physics that prevents anything from moving faster than light. Mexican physicist Miguel Alcubierre first proposed a concept for a real-life warp drive in 1994, but subsequent calculations showed that the device would need ridiculous amounts of energy. Now some physicists claim that adjustments can be made to this proposed warp drive, enabling it to run on much less energy. 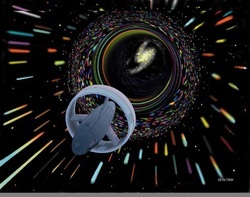 This type of warp drive would have a football-shape spacecraft attached to a large ring encircling it; this ring would cause space-time to warp around the starship. In creating the warp bubble, the spaceship’s engine would compress a region of space in front of it and expanded space behind it, moving the starship to another place without actually moving, and having none of the adverse affects of other travel methods. This would enable the starship to achieve a speed about 10 times the speed of light. White and his colleagues have set up the White-Juday Warp Field Interferometer at the Johnson Space Center, creating a laser interferometer that instigates micro versions of space-time warps. The team are attempting to generate a microscopic instance of a warp bubble in a tabletop experiment, trying to disturb space-time by one part in 10 million.